This month is the debut of the Walima Cooking Club. Our Logo, as many will recognize, is taken from one of Lebanese famous Painter, Mustapha Faroukh’s “Still Life Album". Our club is devoted to Arabic Cooking, and each month a country and dish from that country is chosen by one of the members. This month the county of Algeria was chosen and Khadidja picked the Tanjine Ezzitoun (olive tanjine) for our savory challenge, and Slilet laaroussa which is -translated- "The Bride's Basket" for the sweet part. As a memeber, you get to choose which recipe (or both) you want to make. (both recipes can be found on her blog). I chose the savory, particularly because it incorporated olives. I have a huge craving for them lately (pregnancy? ; ) ), and don't put them in dishes because my hubby hates them. The recipe turned out to be delicious, even though I had way too much sauce left over. I know it is because I modified the recipe to feed just the two of us. I also added some additional spices, and omitted the lamb. Lamb here is just way too expensive, and I would have probably had to go to a specialty grocery to get some. I served everything over rice, but in retrospect I wish I would've used the cous cous I have. Oh well, I'll remember that for next time. I'm so happy to be a member of this new club, and can't wait to see what is in store for next month! 1- In a pot / pressure cooker put the butter /oil, chicken pieces, lamb pieces (if using), the onion, salt, pepper cinnamon. Cook over medium heat until the onions are translucent. Add the chicken cube and enough water to cover the meat. Bring the mixture to a boil then cover and cook until the meat is tender. 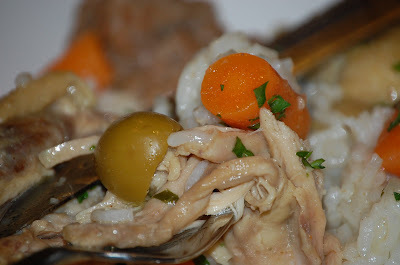 If using both meats, half way through cooking, remove the chicken pieces and continue to cook until the lamb is tender. 2 - In a sauce pan, put the olives and cover with water. Bring to a boil and let the olives boil for 3 to 5 mn. Drain and repeat the same process 2 to 3 times until the olives are no longer bitter.They should not be too salty neither. Set the olives aside. 3- Prepare the meat balls: mix all the ingredients and make balls. Put about 1/2 in of oil in a frying pan and heat over medium heat. Dredge each meat ball in flour and fry until golden brown. Drain on a paper towel and set aside. 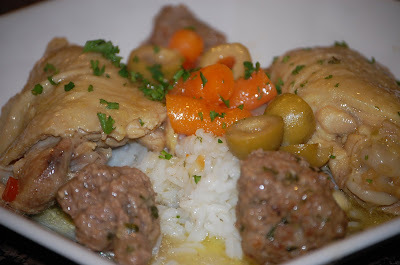 4- Once the meat pieces are cooked, add the olives, the sliced carrots and the meat balls. Bring the sauce to a boil, cover the pot and cook until the carrots and the olives are tender, and the meat balls are cooked through. 5-To finish the dish, mix the butter and flour to form a smooth paste. Bring the sauce to a boil and gradually add the butter/ flour mixture, stirring continuously. Let the sauce boil for 3 to 5 minutes. The sauce should be slightly thick. Add 2 tbsp chopped parsley. Serve the dish accompanied with lemon wedges. thanks for sharing. mine should be posted soon. This looks delicious, good choice to serve it with rice. I am glad you enjoyed the recipe, and to hear the wonderful news about your pregnancy, Inshallah bi salameh ya Rab..
What a fun new group! You know how much I love this cuisine so I can't wait to see the recipes! This group sounds like a great way to try some new recipes. I'll be checking back for inspiration! that chicken looks like it falls right off the bone! so delish. and i loooove olives; we use it in our foods, a lot.